That will keep you motivated and running further, faster, and injury free. Hi, I’m Doug Hay, a runner, coach, and the creator of Rock Creek Runner. About 16 months ago, as I worked through the mountain of running books, tutorials, and programs I own, I discovered something important. For starters, there’s a TON of information out there (and that’s a good thing), but something was missing: There was no practical advice on how to actually use that information! No advice on how to change your bad form habits, how to actually integrate new workouts into the training you’re already doing, or how to use this new advice to ramp up your training without injuring yourself. In other words, all these books and programs I had laying around — and regularly recommended to other runners — were just making us nerdy, book smart runners. Over the next year I developed this twelve-part program focusing on everything you need to know to take your running to the next level. Injury prevention, speed, distance, nutrition, mindset, training plans … it’s all covered in the program. If you want a clear, actionable, month by month blueprint for becoming a better runner, you’re in the right place. 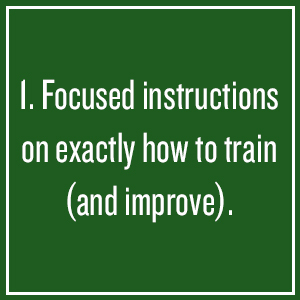 Focused instructions that outline not just the what and why, but also exactly how to train (and improve). Clear goals that keep her inspired and eager for each run. Someone encouraging her and watching out for her needs. A focus, a goal, and someone who’s got your back. That’s the formula I’ve needed to continue to improve as a runner. And after having the privilege of speaking to and working with countless runners through Rock Creek Runner, that’s what I’ve learned almost everyone needs. … Get stronger and build consistency. … Prevent injuries, and strengthen the right muscles. … Maximize endurance, improve your running form and efficiency. By going back to the fundamentals, and breaking down (and building back up) a part of your running each month, you start to become the runner who reaches goals, stays injury free, and achieves things you never believed you could. That formula that helps Monica, myself, and so many others? Yeah, it can help you too. It’s exactly how I’ve structured the new Next Level Runner program. NLR is a goal oriented membership program where — through 12 monthly focuses — we’ll go in-depth on a new topic and set a goal to keep you motivated. Every 30 days the focus shifts to a new running fundamental, each building off the last and serving as stepping stones to help you run faster and injury-free. This isn’t a flat or boring instruction manual that only lays out the information, but instead an active program which you can incorporate into your training, regardless of level or goal. And of course it’s a community of like-minded runners — from all over the world — eager to help you succeed. Sounds Great … But What’s Included in the Program? The program includes 12 monthly focuses, which go in-depth into a new running topic. The entire program (all 12 focuses) becomes immediately available after purchase so you can work through everything at your own pace, with follow-up materials and motivation shared throughout. Think a few hours per month (at your own pace, of course) out-of-your-sneakers learning, then the rest of the month to put what you’ve learned into action through runs and workouts. I know that not all topics are best taught through a single platform, so depending on the month’s focus, we’ll use a combination of video, audio recordings and interviews, worksheets, and text. And to dive in even deeper, several topics will utilize other running coaches and experts. Focus 0: Understanding Your “Why” (and Building Accountability). Before you can achieve your big goal, you need to build a strong foundation. In this pre-program focus, we do just that. Focus 1: Build a Consistent Running Routine. This month includes worksheets, a video interview with routine building expert Jeff Sanders, and a blueprint for creating a sustainable running routine. Focus 2: Perfecting Your Running Form for Power, Efficiency, and Speed. Through 10 separate video demonstrations I outline proper form (from head to toe) and drills to guarantee efficient running. Focus 3: Injury-Proof Your Running. A roadmap to injury-free running, with an actionable interview with coach Jeff Gaudette, exclusive routine videos, and yoga for runners sequence. Focus 4: Developing Powerful Speed (to Propel You Toward Your Goals). This month includes weekly challenges and speed work details, adaptable for every running goal, regardless of the distance. Focus 5: Running With Your Head: Mental Toughness for Runners. Because a runner can only reach full potential when the brain and the body is in proper shape. Focus 6: Addressing Your Weaknesses. Once you’re half way through the program, we review what you’ve learned and revisit any problem areas or weaknesses. Focus 7: Manipulating the Long Run for Better Endurance and Faster Finishes. The long run is the most important weekly runs for every runner. Here we learn how to use long run workouts not just to increase mileage, but also to run faster and stronger on race day. Focus 8: Strength and Cross Training for Runners. Strength training is often the forgotten tool for runners, and in this month’s interview with Exercise Physiologist Heather Gannoe, we learn exactly how it will make you a stronger runner. Focus 9: The Vertical Challenge. A blueprint for mastering the art of uphill and downhill running on the road and the trail. Focus 10: Trail Running 101: How it Will Improve Your Running On and Off the Trail. Proper trail running technique and strategies that will help you become a stronger runner on every surface. Focus 11: Nutrition for Stronger Training and Racing. What you eat not only during but around your run has a direct impact on how you perform. Focus 12: Racing and Pacing Strategies to Blast Through Your Running Goals. After months of training, you want everything to come together on race day. This focus walks you through pacing, race strategies, and how to handle anything race day throws your way. All immediately available after joining the program. Without action, knowledge is useless. Along with the in-depth education will come a new 30-day goal or challenge each month. They’ll be challenging but adaptable to your level and overall goals. Beginner to expert, we’ve got you covered. By joining Next Level Runner you get instant access to 20 race specific training plans (from base building to marathon to 100K ultramarathons), including high and low mile options, and available in both miles and kilometers. Not training for a specific race? Each month you’ll receive a new 30-day training plan that incorporates the focus topic and goal. The plans will build on previous months to ensure that you’re constantly progressing and strengthening throughout the year. And as always, all training plans are delivered through Rock Creek Runner’s unique, interactive tracker, created to help you better understand your training in real time. They’re also designed to be adaptable as you incorporate custom training depending on your race schedule. In my opinion, there’s nothing more valuable than having someone to ask questions to and receive personalized feedback. With Next Level Runner, I’m including a free 15-minute one-on-one coaching call each month — either over the phone or on Skype. We will chat about your training, and work through any struggles or weaknesses you may have. This is something I’ve only done with coaching clients in the past, and have seen firsthand how valuable talking directly with a coach can be. On top of the one-on-one calls, I’ll host periodic live group Q&A sessions. All members will be invited to join the call and learn from each other’s questions. You can expect the live calls every 1-2 months. Just in case you can’t make it live, the coaching sessions will also be recorded and stored within the program. Part of what makes running unique is the strong and welcoming community. So, when designing Next Level Runner, it was important to me that all members could work together and interact. After joining the program, you’ll gain access to FIRESIDE, a private Facebook group, just for members. It’s here so you can hold each other accountable, brag about a big training run, and announce to your fellow runners that you just signed up for a race. We’ll support each other, answer questions, and provide a unique sense of community. If there’s one thing I’ve discovered through Rock Creek Runner, it’s that we can all learn from each other. To help share the stories and lessons from other RCR members, we started a new interview series called Your Stories. Your Stories are 30-45 minute conversations with members just like yourself, and are only available for Next Level Runner members. This interview series will continue to grow each month. We’d love for you to be a part of it. And just because I know some of you will want to dive in and ingest as much information as possible right away, I’ve decided to throw in several bonuses for free. One of the best complements to running I’ve found is yoga. The strengthening, stretching, and balance building poses give you confidence and power on and off the road or trail. As a bonus to this program, Katie Hay, Registered Yoga Teacher (500 level), Yoga Therapist, and my wife, has recorded two balance practices — a quick 20 minute yoga session and a full hour class — designed specifically for runners. What to Eat – Daily advice on how or what’s important to eat and when. How to Run – Tapering for an ultramarathon is more than just reducing your mileage. It’s about running the right types of runs, and the right distances, at the right time. The Blueprint provides a daily schedule of what to run for the final days. A Race Week Action – The bulk of the Blueprint is comprised of daily actions to prepare you for the race itself. With each day comes a different action that will reduce anxiety and increase mental and physical preparedness. In addition to the eBook itself, you’ll gain access to my crew sheet, pace chart templates, and a race day packing list. We take care of our members. In the Bonus area of Next Level Runner, you’ll find exclusive discounts on products and resources you may use as a runner. This bonus is updated regularly with food, gear, and resources I love. But when it comes to Rock Creek Runner products, you can count on some major perks. All current members will receive 30% off physical RCR products (like hats and stickers) and 50% off all digital RCR programs. You can join now to for just 24 dollars per month. By joining now, you’re locking in the $24 rate until you cancel (which, by the way, you can do at any point from inside the membership site). Just picture yourself on a Saturday morning, struggling to find the motivation to lace up your shoes and run. Now picture yourself again on that same morning, only this time your run has a clear focus, you’re working towards a new goal, and you know people are waiting to hear about it. That sounds much better, right? That’s the feeling I’ve designed Next Level Runner to bring. Is Next Level Right For You? I’m not going to pretend this is for everyone. If your training is going great. If you’re improving month after month. Or if you just don’t have the time or energy to put into a program like this, then you shouldn’t even bother. Thanks for reading this page, and I hope to see you around the blog. If you’re feeling stuck and want a clear direction on how to move forward, or if you’re ready to start taking running serious, Next Level Runner can help. There are no experience requirements here. You can be training for your first 10k, or celebrating your 10th ultramarathon. This isn’t about helping everyone reach the same time split or distance goal. It’s about elevating your running to the next level, no matter where your starting point may be. So what do you say? Are you ready to take your training to the next level? Click the blue button below to start training smarter for just 24 dollars per month. Don’t forget, you can quit any time if you discover this program isn’t right for you. Like I said, Next Level Runner isn’t for everyone. We’re all unique, with different learning and running styles and training routines. So I want to make this as flexible as possible. If at any point during the first month you’re not happy with the program, then I don’t want you to pay for it. Just shoot me an email (doug@rockcreekrunner.com) and I’ll refund your money, no questions asked. Take a look around the program. Dive in to the content, connect with the community, and even attend one of the live Q&A coaching sessions. If you decide it isn’t for you, just shoot me an email and you’ll be on your way. I’m just happy you were willing to give it a chance. Click the blue button below to join Next Level Runner today. Questions about Next Level? Just email me at doug@rockcreekrunner.com and I’ll get back to you myself.